Heat oven to 350°F. Spray cookie sheet with cooking spray. Remove dough from can; do not unroll. Cut dough into 4 equal pieces. Shape each into ball, placing seam at bottom so dough is smooth on top. Place dough balls, seam side down, on cookie sheet. Bake 18 to 20 minutes or until deep golden brown. Remove from cookie sheet; place on wire rack. Cool 10 minutes. Meanwhile, heat beef tips with gravy, and cook potatoes and peas with onions in microwave as directed on package and boxes. 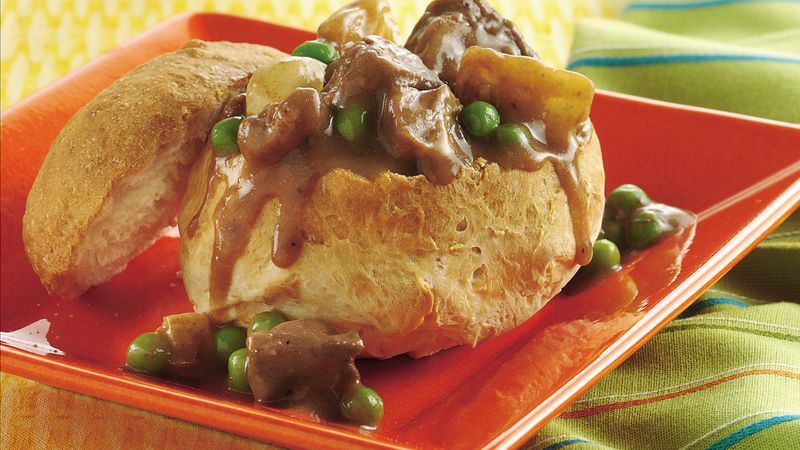 In 2-quart microwavable bowl, mix beef with gravy and vegetables. Stir in remaining ingredients. Microwave on High 1 to 2 minutes or until thoroughly heated. Cut top off each bread loaf. Lightly press center of bread down to form bowls. Place each bread bowl in individual shallow soup plate. Spoon about 1 cup stew into each. Place top of each bread bowl next to filled bowl. Pull cut sides of dough down to bring cut edges together to form ball. Place dough balls, seam side down, on cookie sheet.